When most people plan a trip, the focus is on the purpose of the journey, whether it’s a work-related jaunt or a vacation with loved ones. Researching and organizing travel for an upcoming trip is important, but so is finding the perfect place to make your journey easier, more productive and successful. Proximity will almost always be a factor in selecting the right hotel, but the travel experts at Hyatt Place recommend paying special attention to a few essential details that can make an impact on your overall travel and hotel experience. Guest-centered accommodations. It’s often the little things that make the biggest impact when you’re traveling far from home. Keep the core purpose of your trip in mind as you explore hotel accommodations, and look for those that are most thoughtfully designed around your needs. Seek out hotel options that can make it easier for guests to blur the lines between business and leisure travel with dedicated spaces to work, sleep and play and features like comfy sectional sofas, separate sleeping and living areas and contemporary bathrooms. Better basics. Waking well rested after a long night is a start, but an exceptional breakfast experience can make your day even better. As part of its upgraded breakfast buffet, Hyatt Place hotels across the U.S. now feature regional recipes. For example, hotels in the South feature a turkey sausage and pimento biscuit sandwich, and hotels in the Atlantic region feature cinnamon French toast with apple butter. 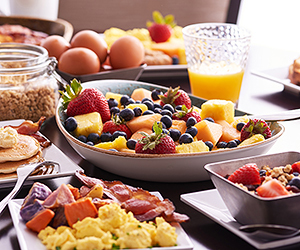 In addition to five regional offerings, hotel guests will find an expanded breakfast buffet featuring cage-free scrambled and hard-boiled eggs, all-natural bacon and sausage, Greek yogurt, fresh-cut fruit, steel-cut oatmeal, a rosemary-garlic potato medley and artisanal breads. Lifestyle options. Whether you want to relax with your morning paper or mix and mingle following a day’s work, it can be liberating to know you have options outside your hotel room. No matter the time of day, public areas, like a spacious lobby and lounge, 24-hour fitness center or indoor or outdoor pool, can provide a chance to enjoy new scenery. Convenient amenities. Many hotels offer the basics, but with an option like Hyatt Place hotels, amenities are purposeful, making your trip as productive and seamless as possible. From free Wi-Fi throughout the hotel and guest rooms to a business center with remote printing and freshly prepared food offerings available throughout the day, guests’ travel and dining needs are covered. Thoughtful service. It goes without saying that quality customer care is an expectation for any stay, but there are some hotels that take service to an extra level. The front desk staff is often the best trained, but it’s pretty simple to spot a hotel that puts a real emphasis on the guest experience. Checking in feels more like a welcome than a process with hosts offering a friendly smile, a greeting in the hallway or a friendly conversation. If you’re traveling to a new city, try reading reviews to get a sense for a hotel’s approach to guest services. Start planning your next trip at hyattplace.com and discover why you’ll never have to settle.